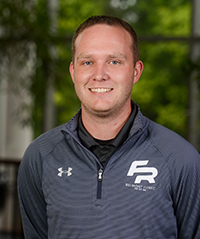 Chance Ryon, a second year graduate assistant in the Department of Fitness and Recreation, was recently awarded a scholarship by the National Intramural and Recreational Sports Association (NIRSA) foundation board to fund his travel and attendance at the group’s annual meeting in Denver. In FitRec, Ryon serves on the Health and Wellbeing Steering Committee and assisted in the design and implementation of the new website as well as preparations for National Walking Day. After compiling all of their research, the group’s guide was drafted and presented at the conference in Denver to more than 200 NIRSA members representing schools from the United States and Canada. The final version of the guide was recently published to the Association’s website and mentions Belmont’s participation in National Walking Day as an example of Campus Collaborations & Partnerships.